This months giveaway prize has been kindly donated by Paula and Gary who own and run WhichCraftuk in Doncaster. They have a fabulous shop in the Corn Exchange full of crafty inspiration and oodles of gorgeous supplies for all your crafting needs. Paula also offers regular workshops in the gallery for crafters of all abilities. Definitely worth a visit if you haven't been in already. 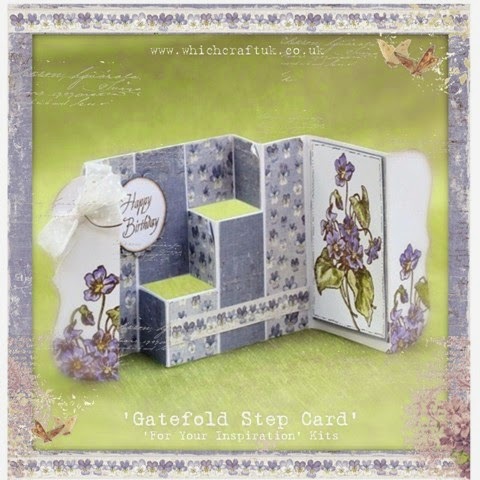 The giveaway kit includes all you need to make two wonderful cards and the Match Box Easel. If you'd like to be in with a chance to win it, just leave a comment on this post between now and midnight on 29th April. The winner will be selected by Random.org and announced on the blog on 30th. Hope you had a great trip!!! Cards look gorgeous..Thanks for this awesome giveaway..
OMG i was just cruising through you tube as these mini albums have caught my imagination. Loving the tutorial and thought id just comment to enter. I am just so happy i found the site and a new shop to browse!!!! Great giveaway this month thank you. Morning Clare, So glad you got back safe and sound and great that the boys had been busy !! 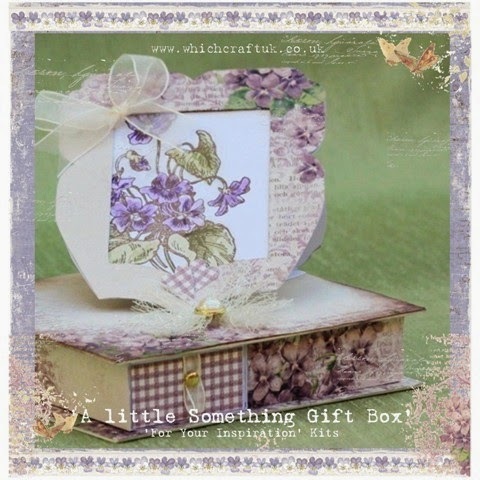 These are fabulous projects, loving the cards and especially the gift box, these are gorgeous, gorgeous papers, my favourite colours too. Good Morning Clare from a very foggy South Yorkshire but what better way to brighten the start of my day than to have a snoop around my favourite blog. I'm just loving the papers used on this new "giveaway" - they are so, so pretty. Thank you for sharing this with us and I hope you enjoy the rest of your day. Sounds like your trip was wonderful. These cards look fab. Thanks for al the inspiration you give and for the chance to win such a lovely prize. Love these colors and so ready for spring! Thanks, Clare, Paula & Gary! love the papers. thanks as always for sharing. 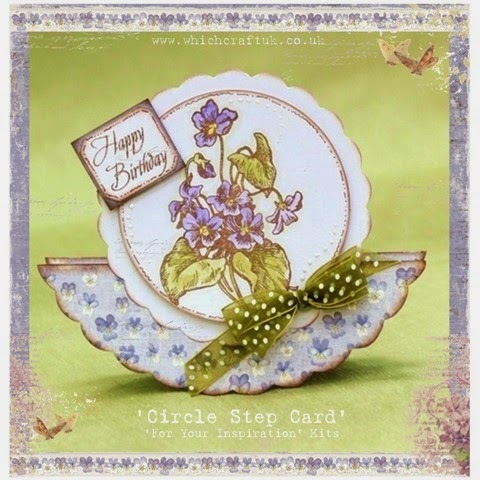 Hi Clare ... absolutely love your blog ... all your creations are amazing! It's a beautiful little box Clare!!! Hope to win!! Glad you had a fun time to see your sister and the sea!!!! Have been resting up after the big 3 day "Chocolate Retreat". Off to coffee/class this morning at PMS, our local scrapbook store! Don't you love the initials, lol, stands for Paper, Metal, Scrappers, the best store!!! Beautiful creations! Love the colors. ooh, what a lovely and fun giveaway! Witchcraft has some great projects. Thank you for the opportunity to win some of their patterns. am new at this blog games great idea for getting crafters to play along. what beautiful crads and creations Clare and gorgeous papers. Lavender is such a refreshing spring color. Paired with just the right green, this color combination can't be beat. Thanks for this opportunity to win a product pack! Your creations are just awesome!! I love it everytime I get a mail from you, to see what you made this time. Thank you! What a lovely giveaway. I adore the mauve violet colour scheme. Reminds me of my old granny. It was her favourite colour. Thanks for the chance to win. Great giveaway and love the cards. You do wonderful tutorials. Hi Clare, it would be just great to win, your work is amazing!! All your work is beautiful! I'm always inspired by it. Beautiful colors. Thanks for the giveaway. Beautiful papers and a great giveaway! Thanks for the opportunity to win! I love your videos. Appreciate the opportunity to enter the free drawing and also the generosity of the shop that donated the products. I'm going to check them out now. Thank you again for the chance to win such a lovely giveaway. You have become one of my go-to-gals when I'm lacking inspiration. Love your work. My goodness this kit is so nostalgic it makes me think of my Grandma, put my name in the hat for a chance to win Clare and thank them for their generosity of offering this up to one of us! Hi Clare all af your things are fantastic. Thank you for the chance to win good luck to everyone! This kit would make perfect cards for my mother-in-law. She loves to garden and her favorite color is purple! Thanks so much for the chance to win! Love the paper! Thanks for the chance. Going on Holiday is always nice, but, glad you made it home safe..I love the giveaway..Beautiful..
That paper is simply gorgeous, the kit looks so fun. :D Glad you had a wonderful visit with your family. What great projects! I love the gorgeous violets. It would be great to win. Beautiful projects!! Thanks for the chance to win. Super prize, thanks for the chance to win. Gorgeous cards Claire and a lovely box. WhichCraft always seem to have such lovely paper stock and would love to win this. Sorry Claire not sure how I managed that, but I really really do like the cards lol!! WOW! I LoVe the color purple & I love the cards. This is a win win giveaway. This is my first time here & such a generous giveaway. I love a good give away. Thanks so much for sharing your creativity and your inspirational ideas. Beautiful kit! Lovely colors for spring - which is on it's way! Oh my how pretty are those violets!, Love them. Thanks for all you do Thanks to Whichcraft for the lovely donation! Happy crafting to all. M.E. what beautiful paper and prizes. thank you for giving us a chance to win it! How Beautiful, I love love love your creativity. Miss uk, but i've never been to the south.... The paper is fantastic! Thanks for the chance! A big hug! Beautiful card set, especially with Mother's Day coming up. Thanks so much. Purple is my favorite color--would love to make the cards and easel for Mom and friends. Very generous of you to share such a giveaway. Thanks for the opportunity. I will be nice if I win, so I can give it a try to making cards. What a great gallery of ideas for a fantastic giveaway. Thank you for offering it to the whole world, even us folks 'down under'. These cards are gorgeous, I would love to win the kit so I could make them. Thank you for this opportunity. So very gorgeous! Thanks for a chance for winning. Love your work!!! Please enter me!!! I have some left over WOC flowers that would go perfect with that paper! How pretty! The papers are beautiful. Thanks for the chance to win. Love your videos. I always love your tutorials! Thanks for making them and using them as a way to share your craft making talents with all. I'd love to win the beautiful trio projects that you feature. Many thanks for the opportunity.